the Son of God, who loved me and gave himself for me. Look at the first part of the name. What does it mean that Jesus is the Son of God? Think about this name. Although Jesus is the Son of God—the God of the Universe—He loved you and gave Himself for you. He took your place, paying for your sins so you could live with Him forever. Now that’s love! Can you imagine a love greater than that? Think about the words to that song. Jesus was in Heaven, surrounded by astounding glory and adoration. He laid all that aside for you and me. We were on “death row,” condemned to die for our sins, because we couldn’t stand before a holy God. Jesus, the perfect Son of God, signed up to take our place on death row. He paid our penalty. That is incredible love! Thank You, Lord, for Your marvelous love for me. Thank You that though You are the Son of God, yet You loved me so much that You gave Yourself for me. I can’t even begin to understand the depths of Your love. Open my eyes to be able to see how much You really love me. © 2013 Relationship Resources, Inc. All Rights Reserved. El Shaddai in Hebrew means the all-sufficient God, God Almighty or the One Who is all-powerful. In 2 Corinthians 12:9, Jesus said, “My grace is sufficient for you, for my power is made perfect in weakness.” God’s grace is all you need. El Shaddai is sufficient for you and for me. Meditate on the name, God Almighty. He is all powerful. He is sufficient for all that you need. What does it mean to you today, knowing He is all you need and His grace is enough? Thank and praise the Lord that He is God Almighty. El Shaddai, I’m so grateful that You are the all-sufficient God. You are all I need in every area of my life. Thank You that I can depend on You. Teach me to rely less on myself and more on You, God Almighty. To get a free copy of “Unlocking Joy” click the link. © 2014 Relationship Resources, Inc. All Rights Reserved. Jesus quoted this verse about Himself in Luke 4:17-19. Spirit of the Lord God is a compound name in Hebrew. ruah means spirit, breath or wind. Adonai meanslord, master and controller. Yehwih is a variation of Yahweh. It is only used after Adonai, but the Jews pronounce it Elohim so they don’t say the same word twice in a row. Meditate on this name. Ask the Lord to reveal more of Himself to you through it. Today, as we celebrate the freedom we have in the United States as a nation, we want to look at the freedom that God brings us. As this verse says, Jesus came to bring us freedom. In what ways do you need the Lord to bring you freedom? Ask Him to show you any ways you are held captive—it could be in your thoughts, your feelings, relationships, people you need to forgive, etc. The Lord wants you to have complete freedom. Thank Him that He came to bring you freedom. The Spirit is also on us, sending us to bind the brokenhearted and proclaim freedom for captives. How can you do that in your sphere of influence? One way I do it is through the Sozo ministry . Spirit of the Lord God, I worship You today. Thank You that You came upon Jesus and anointed Him to do all the things in this verse. And thank You Holy Spirit that I can claim this verse for myself, because I know You have anointed me to do Your work. Teach me more about Yourself and this name. Listen, God! Please, pay attention! Can you make sense of these ramblings, my groans and cries? King-God, I need your help. Every morning you’ll hear me at it again. This name is Melek Elohim in Hebrew. Melek means king or royal. Elohim means God, judge, great and mighty. God is the King of the universe and yet He is a God we can talk to and who listens to us. How has God answered your prayers recently? In what areas do you need help? King-God is listening, waiting for you to call. Talk to Him today. Have you ever met a king? I haven’t, although I did meet the President of Guatemala. I even got a hug from him at church one Sunday. It was such an honor to meet him, yet it is much more of an honor to know the King-God. In this verse, King David is asking God to make sense of his ramblings, his groans and his cries. Can you relate to that? Anytime you are having a hard time making sense of how you’re feeling and even your ramblings, you can ask God to help you figure it out. David says that every morning he talks to God. I believe it is important to start every day by spending time with the Lord, talking to Him as well as letting Him talk to you through His Word. What a privilege to talk to our God and King every day. To get a free copy of “Unlocking Joy” go to https://www.rrbooks.org/free-e-books. It seems our Creator puts a lot of stock in names. I’m sure He knows my name but do I know His? 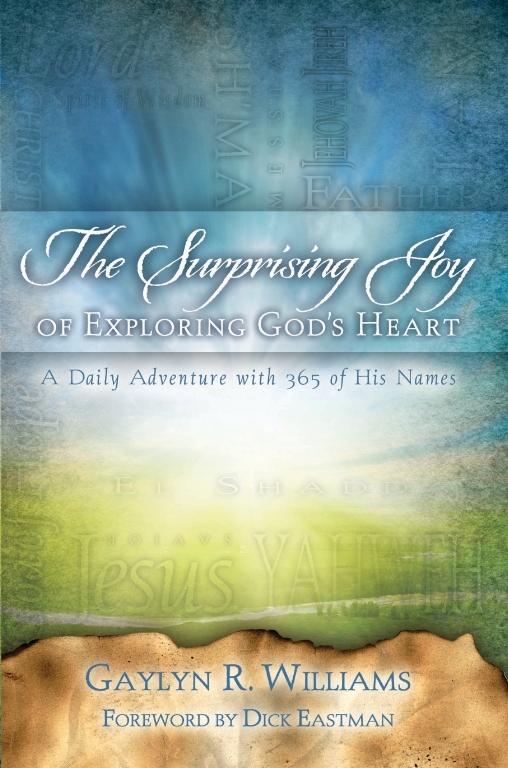 This exceptional daily devotional reveals God’s character. What a relationship builder is this guide to all who want to draw closer to God. And when we draw closer to Him, “blessings” happen. The Hebrew word for faithful is emeth and means certainty, truth, trustworthiness, establishment, faithful, right, sure and true. Some versions translate this name as “The God of Truth.” El is the singular for Elohim. Merriam-Webster* defines faithful as, “steadfast in affection or allegiance; firm in adherence to promises or in observance of duty; given with strong assurance; true to the facts, to a standard or to an original.” Think about these definitions. What does it mean to you that God is your faithful God? I have seen God’s faithfulness in my life so many times. One example is in how He has provided for all of my needs, sometimes in a miraculous way. As a young single mom, I was so poor that I was turned down for the indigent health care. Why? Because I didn’t make enough money. That is a true story! However, even though many months I didn’t have enough to pay my bills, yet I always paid them—from my own checkbook. I can’t explain it, except for God’s faithfulness. He is faithful to you too. Because He is faithful, we can depend on Him for anything and everything. Often we can’t depend on people to remain faithful to us, but we can stake our lives on the fact that God won’t ever change. Thank You, My Faithful God, for always being faithful to me. I praise You that You are trustworthy, truthful and dependable. Teach me to trust You more and rely on You for every area of my life. To get a free copy of “De-Stress Your Life” go to http://www.rrbooks.org/free-e-books. Olam means eternity, perpetual, always and continuance. Zeroa means arm, strength and power. God’s strength and power are always with us. This is one of my favorite verses. When I’m going through a tough time, it helps me to remember that when I hit the bottom, I’m resting on God’s everlasting arms. That is so comforting. Right now, imagine yourself resting in God’s arms. Meditate on God’s everlasting arms. Ask Him to show you what they look like and feel like to you. Thank You, Lord for Your everlasting arms that are always underneath me. Help me to learn to feel Your arms around me and under me during the easier times in my life, so I can recognize them quicker when times get harder. · The word for Mighty, Gibbor, in Hebrew means powerful, strong and valiant. · Jeremiah 32:18: “You show steadfast love to thousands, but you repay the guilt of fathers to their children after them, O great and mighty God, whose name is the Lord of hosts” (ESV). · Luke 22:69: “But from now on, the Son of Man will be seated at the right hand of the mighty God” . · What do these verses say to you about the Lord? · In Isaiah 9:6, the Messiah is referred to as the Mighty God. In Luke 22:69, the Messiah will be seated at the right hand of the Mighty God. What does it mean to you today that both Jesus and Father God are called the Mighty God? · In what ways do you want to see His might, His power? · Continue to memorize Isaiah 9:6. Memorizing the Word isn’t as hard as many people think it is. Simply reading it repeatedly and meditating on it will get it into your mind and heart. Mighty God, I worship You today. Thank You that Your strength is not like any human’s. You are all-powerful. There is absolutely nothing that is too hard for You. Thank You that I can lean on You and trust You for everything in my life.